The main objective of this book is to investigate the behavior of nonlinear unstable dynamic economic systems. In particular, we are interested in the behavior of dynamic systems near critical points. In the preceding examples, we showed that dramatic changes and chaotic economic behavior occur when linear stability is lost due to small shifts of parameters. However, analysis of nonlinear phenomena often involves sophisticated methods, especially when the problem is defined in many dimensions. It is rather desirable to develop some methods to reduce a high-dimensional problem to a lower one. The Haken slaving principle may be used to eliminate some of the variables when the system is close to points where linear stability is lost, so that the macroscopic behavior of the system is governed by very few degrees of freedom only. We can also find similar ideas in the center manifold theorem, although the slaving principle is more general. 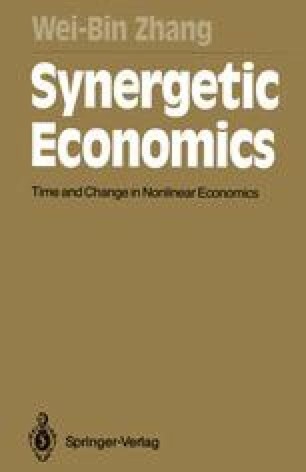 In this chapter, we are also interested in the role of adjustment speeds of economic variables and the time scale of the study in economic analysis. ... we are in fact raising a problem of understanding, and this always turns out to be a problem about a problem; that is to say a higher level problem.